1. Make sure you have necessary supplies on hand. Rubbing Alchohol, Cotton balls, powder, spirit gum or medical adhesive, liquid latex, castor oil sealer, cream base color, highlight, shadows, blush color, lip color, final seal,spirit gum remover. 2. Prepare the appliance and the actors face! Preparation of your appliance is important. If you are using a woochie pro foam style prosthetic you will want to prepare your appliance with a coat of castor oil sealer prior to make-up application. This will allow the cream base make-ups to adhere properly to the appliance. Let the caster oil sealer dry before applying make-up. If you do not use castor oil sealer, you will have to purchase make up that was developed specifically for prosthetics. 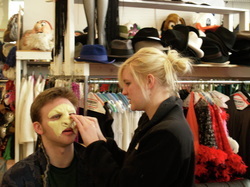 Next, prepare the actors face by doing a quick wipe down of a clean face with rubbing alchohol. This will remove any oil from the face so the adhesives will work effectively. Selection of adhesive is also important. 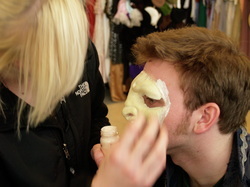 Spirit gum will work for most actors and performance situations. Some situations will require medical adhesive, which has a slightly stronger bond than spirit gum. Medical adhesive should be used if the actor will be wearing the prosthetic for extremely long periods of time (such as a full day video shoot) or if the actor has extremely oily skin, or sweats excessively. 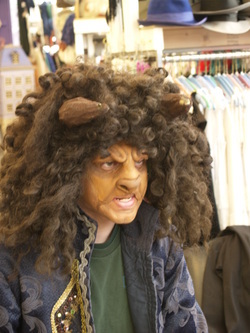 For theatrical productions, spirit gum is usually strong enough. Dress rehearsals provide the perfect test for the spirit gum. For individual party or Halloween use, spirit gum is usually the appropriate choice..
3. Fit the prosthetic appliance to the actors face. 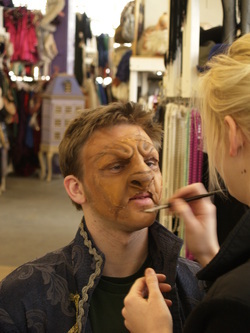 This step is important to insure the appliance fits the actors face properly. Some faces are wider, longer, etc. than the face used for the original mold. If you need to extend the prosthetic, you can do so either at the bridge of the nose and across to the side of they eyes, and to the corners of the mouth, and the full face appliances can be attached in two or three sections rather than as one piece. Any crevices created by the separation of the appliance can be filled in with liquid latex. Ocne the appliance is prepared to fit the actors face, it is time to attached it. 4. Attaching the prosthetic appliance ot the face.